I’ll take a Mimosa, hold the o.j. Happy New Year! We started out our first day of 2011 processing chickens. This was not by choice but by necessity. An unpleasant task, but a practical one, because it means a freezer full of chickens, or so we hope – man, is it a lot of work! First new year’s resolution: I will not order 125 baby chicks for any reason. For the life of me, I can’t remember the warped rationale that prompted this. Did I think I was going to be a chicken farmer some day and needed the practice? Did I want to torture the family? Did I buy stock in chicken feed and feel the urge to drive company profits? Whatever it was, it escapes me now as I am up to my elbows in…well, never mind. Don’t worry, I still have some of my city sensibilities left so I won’t be posting any graphic pictures, but there is a lesson here – the very reason for this blog, to share success and failure and experiences in the journey towards sustainability. First thing in the morning on the day your chicks arrive, the local post office will call you: “Hey Mrs. Crazy, your chicks are in!”. When you go to pick up your baby chicks, because of the nature of the small southern town you live in, you will find that the staff politely snickers and looks at you sideways. Why? Because it’s a small town and Yankee stupidity is FUNNY! The real work starts when you get them home. Every chick is given a once over for health issues and as they are added to the brooder their beaks are dipped in water so they will know how to drink. ALWAYS HAVE YOUR BROODER READY AND WARM AHEAD OF TIME! The day before the chicks arrived, I was still trying to figure out my brooder arrangements and since the kiddie pool I had used before only held about 45 chicks, it dawned on me that I might be in a bit of a pickle. I opted to convert my greenhouse shelving into a brooder with aluminum sheeting (flashing) and carpenter cloth from the local hardware store. We added a side door and with 2 heat lamps, we were good to go. Until, that is, about 3 days into baby chick brooding when I realized that the exponential growth rate of a chick was not factored into my brooder size calculations. Luckily, we had a second greenhouse shelving unit. At this point, I became painfully aware of what poultry farmers already know. 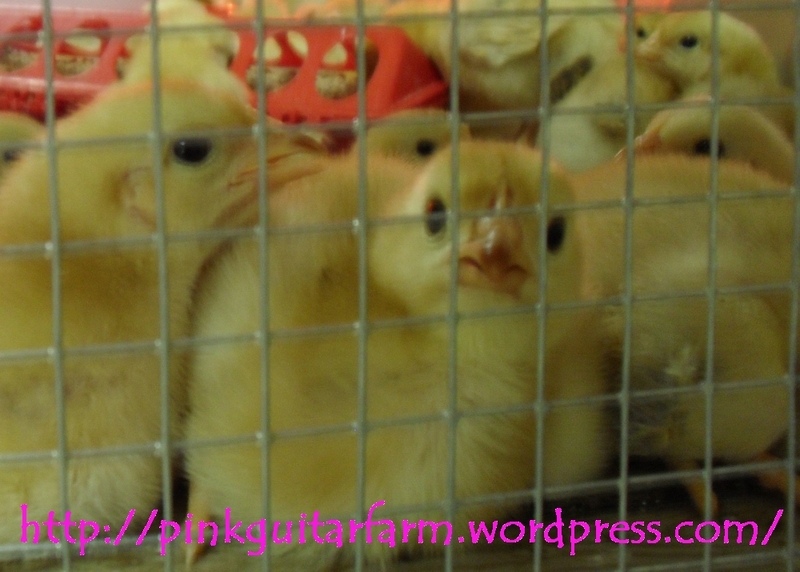 Baby chicks eat a lot, they also poop…a lot, frankly, I think more comes out than goes in! It’s really gross! Two weeks in the brooder and I was ready to put them outside in the coop. People, please find a poultry farmer and thank them! This is a dirty, thankless job! Oh! And here was another realization, the coop was too small. Maybe I thought I would have a lot of loss? We actually lost less than 10% in the 3 months we have had them. Thanks to the LGD’s, and the hardy nature of this breed of chicken, we were lucky, despite my ignorance. No doubt, I was unable to conceptualize what 125 chickens meant on any level. So here we are, 3 months later, with an insane number of chickens running around the yard, free to go where ever they please. Except, since it is winter there is not much to range. So of course, they have identified food with humans and whenever we walk into the yard, try to get in the car to run an errand, open the front door, make a noise, etc., we re-live the movie The Birds, except this is a ground assault! Today, we put another 10 in the freezer. 29 down, who knows how many to go? Paul is the executioner, the kids are the pluckers, I gut the birds and Paul puts them in the freezer. We have a good system. It’s quality family time. How did we get here? Our learning curve has been steep over the past year. Taking advantage of our new year’s resolution and reflecting on 2010 in order to make better choices on the farm I asked each family member why we do this. Sophie said “so that we have fewer antibiotics in our food”. Paul said “so that we know where our food comes from”. Jack said “because we are stupid”. I say “so that chickens get to be chickens” We do this for their health and subsequently ours, even if it seems stupid. So what the hell does this all have to do with a Mimosa? I don’t know, it’s the new year, people! A time to celebrate new stuff on the horizon and put a tough year behind. 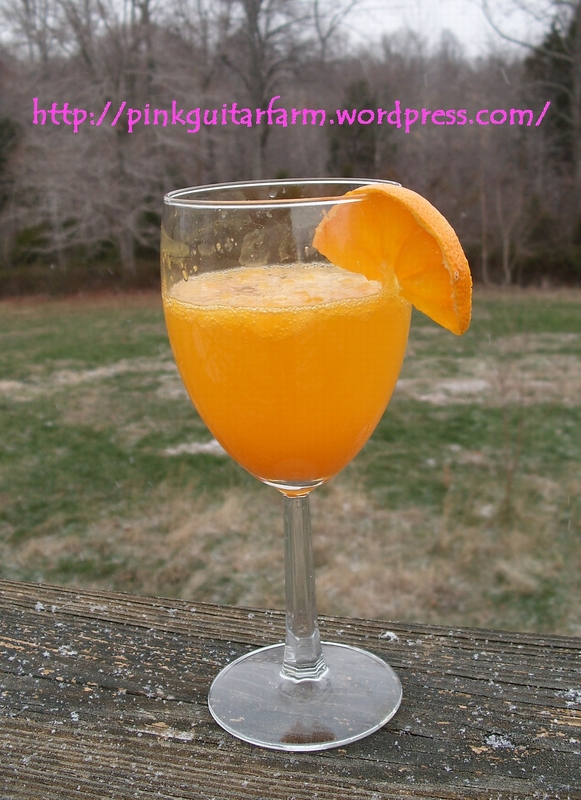 You can have a Mimosa, even if you are processing chickens. I had one with fresh squeezed tangerine juice from fruits sent to us all the way from California, no less. Thanks Scott and Eileen and also Bob and Kathy for brightening our winter with citrus! Hold the o.j., I’m out of tangerine juice, I’ll take the next one neat. Cheers! Lordy, lordy, what were you thinking???? I remember when you wouldn’t let Jack have a chicken! and now it seems you are making up for the years without chickens! I haven’t gotten to the point that I could raise chickens for dinner – they are still breakfast chickens. The turkeys we raised were quite wonderful and I am contemplating a goose or two next year. The rack of lamb we had for Christmas was delightful! You should try a lamb for diversity! I know, I know – this is crazy. How many chickens does your household go through a year? I figured I only wanted to go through this once a year – WRONG strategy! I want to raise sheep, especially after eating your farm-raised lamb. AMAZING! Wondering if Paul will let me, after this chicken debacle. Happy New Year! Hope the chickens tasted great! Delicious! You have got to taste our REAL buttermilk soaked fried chicken! Happy New Year! We miss you guys! They’re tasty! Kid’s will give you lessons! Looking forward to your visit!